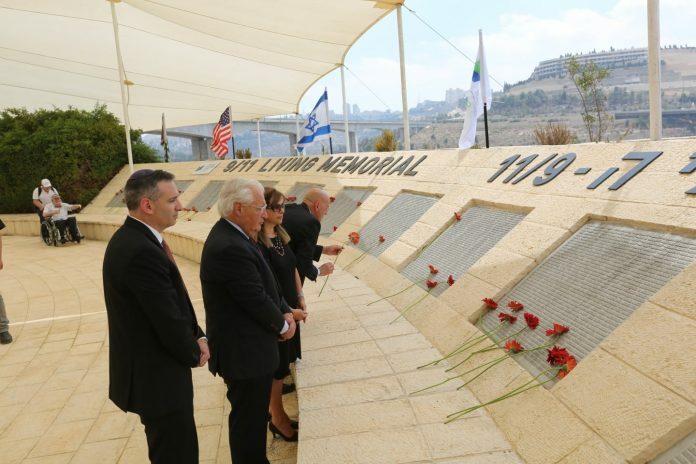 The memorial ceremony took place at the only 9/11 memorial outside the United States — a 30-foot-high bronze sculpture created by Israeli artist Eliezer Weishoff and landscape architect Yechiel Cohen. “In this beautiful plaza, at this inspiring location, we remind the families of those lost, and we confirm to people everywhere, that we stand together — Americans and Israelis — and that together we continue to heal and to build, in a spirit of solidarity and commitment to the future,” said U.S. Ambassador to Israel David Friedman.